The Atlantic Area covers the western part of Europe bordering the Atlantic Ocean. 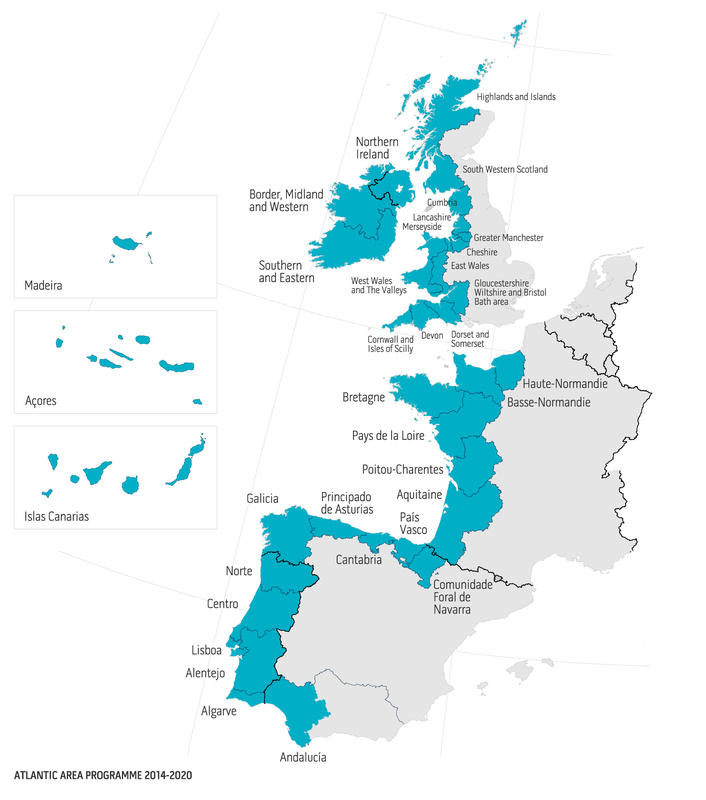 It comprises 36 regions from the western part UK, Ireland, Portugal, the northern and south westernmost part of Spain and western France. The Programme covers an expanded area compared to the previous Programme (2007-2013) due to the inclusion of new regions: Canary Islands (Spain), the Autonomous Regions of the Azores and Madeira (Portugal). The participation of the three insular regions will contribute to a more cohesive Atlantic Region, increase its natural and cultural heritage and enhance its comparative advantage related to its maritime perspective. France Haute-Normandie; Basse Normandie; Pays-de-la Loire; Bretagne; Poitou-Charentes; Aquitaine. Ireland Border, Midland and Western; Southern and Eastern. Portugal Norte; Algarve; Centro; Lisboa; Alentejo; Açores; Madeira. Spain Galicia; Principado de Asturias; Cantabria; Navarra; País Vasco; Andalucia (Huelva, Cádiz and Sevilla); Islas Canarias. United Kingdom Cumbria; Cheshire; Greater Manchester; Lancashire; Merseyside; Gloucestershire, Wiltshire and Bristol/Bath area; Dorset and Somerset; Cornwall and Isles of Scilly; Devon; West Wales and The Valleys; East Walles; South Western Scotland; Highlands and Islands; Northern Ireland.